The best-prepared Carnival revelers stock up for the parade route as if they're spending a day tailgating. They have grills and folding tables full of food and coolers loaded with drinks. They look like they have the right idea, but I’m just never that prepared. I’m usually arriving at the Uptown parades by bicycle anyway. Sometimes a friend’s house near the route will serve as home base and hospitality central, but otherwise finding proper parade provisions means turning to the bars and practicing the time-honored New Orleans tradition of bouncing from place to place between go-cups. This approach always seems to take me somewhere new each year, and frankly I think that’s part of the pleasure of the season. The welcoming, convivial, all-embracing spirit of Carnival opens many doors. It’s a good time to check out bars that are new, that you might not normally visit, or that may have fallen off your radar. Here’s a scouting report on a few on or near the route, listed in order of appearance traveling the same direction as the parade. The Milan Lounge (1312 Milan St., New Orleans, (504) 895-1836): This neighborhood joint doubles as the city’s home base for Chicago Cubs fans during baseball season, and during Carnival season it’s a cozy, friendly, busy, offbeat cove for a few drinks near – but not too near – the bedlam of Napoleon and St. Charles Avenue. Just remember that its name (and street) is pronounced like “my-lyn,” and not like some Italian city spelled the same way. The Mayfair Lounge (1505 Amelia St., New Orleans, (504) 895-9163): Another backstreet classic, this time a good deal closer to the route, the Mayfair seems custom-cut for Mardi Gras parades. At least it’s decorated for them. The ceiling is strung with a kaleidoscopic collection of knickknacks, streamers, flags, stuffed animals and sundry items. It feels like a bit of the parade route has followed you inside here while you quaff a few cold ones. 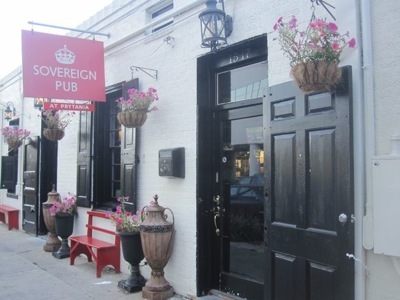 Sovereign Pub (1517 Aline St., New Orleans, (504) 899-4116): Found down a side street, this pint-sized pub could just as well be in the middle of some English village as the middle of the parade route. Hard cider on tap, a quirky British décor and a rocking jukebox are among its charms. Evangeline Two (1743 St. Charles Ave., New Orleans, (504) 523-4500): This address has seen a number of different bars come and go in recent years (including one with the odd and disheartening name of Whiskey Dix), but the Evangeline Two seems to be righting the ship. It’s the spinoff of the Evangeline, a backstreet bar in Mid-City, and has a similar vibe, with a good beer selection and a small stage that often features local bands. The Avenue Pub (1732 St. Charles Ave., New Orleans, (504) 586-9243): Just across the street, the Avenue Pub is a first-class destination for beer connoisseurs. It’s been ranked among the nation’s best beer bars, and it is definitely tops for New Orleans. They often pour beers into brew-specific glassware here, but that doesn’t mean you can’t get one of their distinctive drafts in a go-cup to hit the route, too. The Big Top (1638 Clio St., New Orleans, (504) 569-2700): This is one of my favorite casual Carnival stops, even though it isn’t truly a bar. The Big Top is a multi-purpose arts and events space on the edge of Central City. Local rock bands perform here after many of the parades, and there’s always a bar set up to serve drinks. There’s art all over the walls and there always seem to be a few kids romping around, too, as their parents take a break between parades. The Circle Bar (1032 St. Charles Ave., New Orleans (504) 588-2616): This joint has been an anchor of Lee Circle for years, and it’s positioned right where floats and bands make their dramatic turn along its curve. If you haven’t visited in a while, you’ll find a better beer selection and the results of a renovation that makes the place feel a little more spacious – though you’ll quickly be back outside watching the parades sweep past anyway. Bellocq (936 St. Charles Ave, New Orleans, (504) 962-0900): A sibling bar to the Uptown cocktail phenom Cure, this is the more refined and decidedly upscale foil to the Circle Bar just across Lee Circle. The specialty here is the cobbler, a pre-Prohibition libation made with distinctive liquors or fortified wines, crushed ice and berries. Victory Bar (339 Baronne St., New Orleans, (504) 522-8664): A block off the route as it continues through the heart of the CBD, this is a craft cocktail spot cut from a different cloth. It’s more clubby, and it has a sort of throwback ‘90’s look to it. They shake up a serious cocktail here, and there’s a short food menu, too. Capdeville (520 Capdeville St., New Orleans, (504) 371-5161): The single-block Capdeville Street has been around for a long time, but it was this modern gastropub that put it on the map for most people. As it turns out, the street and its namesake tavern are pretty well placed for Mardi Gras, sitting just across Lafayette Square from the official parade viewing stands at Gallier Hall. Good local drafts, whiskey cocktails and upscale pub grub await (don’t miss the poutine fries and the mac and cheese). Barcadia (601 Tchoupitoulas St., New Orleans, (504) 335-1740): Just a few weeks old, this bar/arcade mash up has two dozen vintage, coin-op video games lining the floor and about twice the number of draft beers at the bar. You can get go-cups here, of course, but if you develop a case of Pac-Man fever you might just decide to stay anyway.